In this world, Zackie Achmat is a hero: the founder of the Treatment Action Campaign in South Africa, he recently won a breakthrough in his long battle against the vitamin-loving Aids denialists of Mbeki’s government, to make HIV medication available through the public health system. 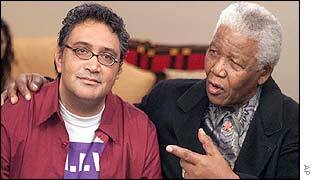 Achmat is also HIV positive, and was wealthy enough to afford antiretroviral medication, but deprived himself, risking his own life, as a matter of principle, until they were made widely available, despite even the personal pleas of Nelson Mandela, an avowed and public supporter of both antiretroviral medication and Achmat’s work. Achmat’s victory, tragically a decade too late, was a deep wound for Matthias Rath, the German vitamin impresario who claims that his vitamin pills are better for Aids than medication, and his colleague Anthony Brink, a barrister and the leader of an allied organisation, the Treatment Information Group, which campaigns vociferously against the currently available antiretroviral medication, claiming – loudly – that they are not just ineffective but actively harmful. This man Anthony Brink has now managed to file a complaint against Achmat with, of all places, the Hague international criminal court: Achmat is accused of genocide, for successfully campaigning to get access to HIV drugs for the South African people. Now I have read this ridiculous document – which has been reported as a proper news event in much of the gay and South African media – and for the first 50 pages or so you get the familiar anti-medication and Aids-denialist stuff: they talk up the side effects of HIV drugs, they misrepresent the research. But then, at around page 58, by which time any journalist covering this story must, I can only assume, have stopped reading, this “indictment” document suddenly deteriorates into full-on fruitcake action. Brink “respectfully submit[s]” that the international criminal court should punish Achmat with “permanent confinement in a small, white, steel and concrete cage, bright fluorescent light on all the time … warders putting him out only to work every day in the prison garden to cultivate nutrient-rich vegetables, including when it’s raining”. This is supposed to be a serious war crimes document, remember. Then it gets nasty. Achmat should be forced to take his HIV medication (“which he claims to take”) and it should be “pushed if necessary down his forced-open gullet with a finger, or, if he bites, kicks and screams too much, dripped into his arm”. And how will this forced administration be possible? He should be, white barrister Anthony Brink respectfully submits, “restrained on a gurney with cable ties around his ankles, wrists and neck … until he gives up the ghost on them, so as to eradicate this foulest, most loathsome, unscrupulous and malevolent blight on the human race, who has plagued and poisoned the people of South Africa”. I don’t think it’s out of line to suggest this is particularly vile considering that Achmat is a “coloured” man, by the apartheid government’s classification: and let’s not forget that Achmat, a longstanding anti-apartheid and gay rights campaigner, was imprisoned under that brutal regime. Achmat has been nominated for the Nobel peace prize, and is a hero in ways you’d better hope you never get the chance to be. Meanwhile this vicious and unhinged hatred, this surrealist charge of genocide, comes from a colleague of the vitamin peddler Rath: from Anthony Brink, from the man who is credited with introducing Mbeki to HIV denialism, who has helped cost the lives of tens of thousands of people needlessly deprived of effective treatments. ToeKnee — love the tomato quote, is it your own invention? I think I might have to steal it.